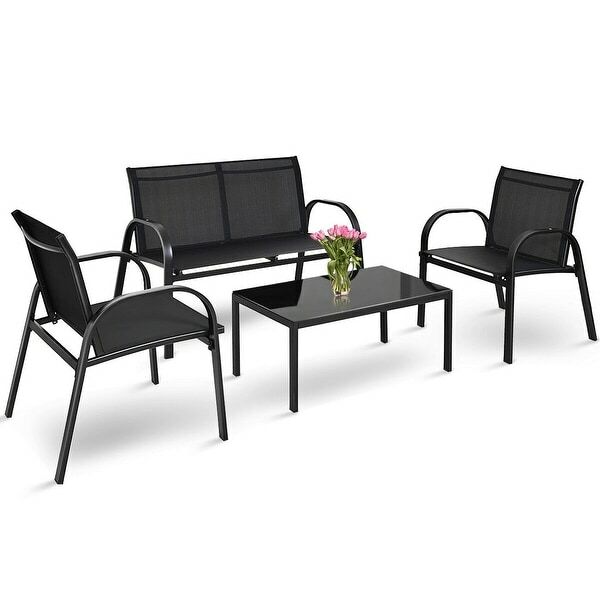 This is our 4 pieces black furniture set, including 1 loveseat, 2 single sofas and 1 tea table with glass top. It is in high quality. This furniture set is very useful. It can not only make your outdoor life more comfortable, but also make your garden more beautiful with its fashionable and modern style. It is made of metal material, which makes it sturdy and can serve you for a long time. The tea table with a glass top is stable and provides you with enough storing space. What a great furniture set! Do not hesitate! Come and buy one! The chairs were very very hard to assemble. My fiancé and I took forever trying to put the chairs together and it was hard since the material is some type of metal. The pieces just didn't fit nicely and the measurements were off which made it even harder to assemble. The materials were just so cheap. The table is very poorly made and doesn't sit straight. It wobbles. I purchased two items from costway the same day and am disappointed in both of the purchases. Will not be buying anything from them again. Okay, so I was really hesitant to buy. However, I was pleasantly surprised by how comfortable the seats are. They lean at the perfect agke so you aren't just sitting upright uncomfortably. The table makes me a little nervous because it's a suction cup keeping it in place-but it looks nice. I put the thing together myself so I can say it was completely feasible for someone who isn't really that handy. The price was totally worth the buy. I hate that little tool thingy you have to use but that could be that I don't use it properly. Overall, good buy for price range. Very good quality and sturdy! I had such high hopes for this set after reading the reviews online. However, after over 2 hours now I STILL have not finished putting it together yet. Only 1 set of the screw holes line up, not all the screws are the same size. My fingers are completely raw after trying to screw in the pieces with holes that are not lined up. I will never buy this brand of patio furniture again. I love this outdoor set! It is comfortable and not too bulky. Perfect buy for our small patio out back! Nice patio furniture, though it takes alot of time and effort to assemble. The seller was very helpful. The patio set was the perfect fit for our 4 bad 2 bath apartment patio. It was easy to assemble, with three of us it took a little less than an hour. The set is cheap, simple and comfortable, we have no complaints. Took a while for my husband to assemble, but looks good. The furniture has been on a covered patio for a year and is not holding up. This was very easy to put together and it looks very great on my back patio. small but cute for our little front porch. again sturdy enough for the special needs child to sit and not worry about him falling or it being damaged. Safe for him and others. You get more for your money with this particular seating group. "Is there any faster shipping so we can get this before july 10th? Thank you in advance"